Heidi Thomas outside the courtroom. 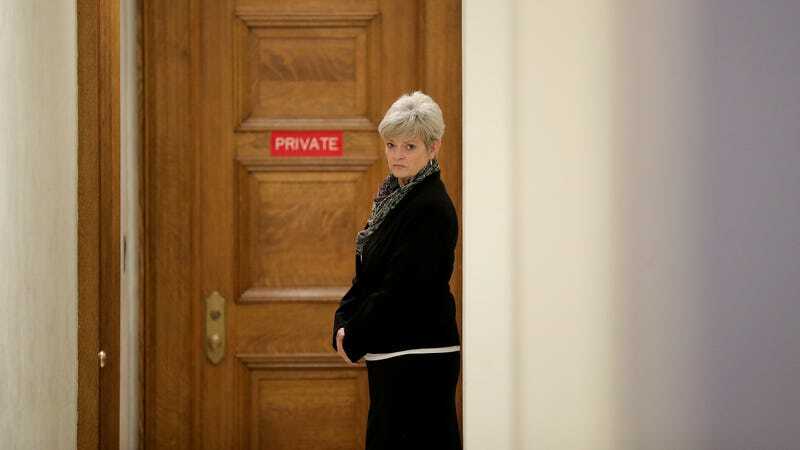 NORRISTOWN, Pennsylvania—The first of the five women expected to testify that they, like Andrea Constand, were drugged and sexually assaulted by Bill Cosby took the stand Tuesday afternoon in the retrial of the disgraced comedian. Thomas has told her story before. She first spoke out in 2015 and was a part of the document Cosby: The Women Speak. But this time, Cosby was in the room, and a conviction depends on whether or not a panel of jurors will believe her. She was supposed to call a person, she was told, called Mr. C. She later learned it was Cosby, but she had to keep that to herself. The plan, according to her testimony, was for Thomas to fly to Reno, Nevada, to meet with Cosby for the promised mentoring. Montgomery County District Attorney Kevin Steele showed pages from Thomas’s scrapbook in court. She’d saved her airplane ticket, her travel itinerary, bought post cards, and taken pictures. She didn’t travel much, Thomas said, and even made a self-effacing tone at how she took pictures with her “Kodak Instamatic.” She even saved two green drink tickets from Harrah’s Reno Hotel and Casino. Cosby greeted her at the door, told her to get comfortable, and had her perform a monologue for him at a kitchen table. She said he seemed unimpressed, but also said she wasn’t surprised because “I’m little nobody from Colorado who is with this great man. I didn’t expect him to be thoroughly impressed. That’s why I’m here.” He then asked her to do a cold read in which the character she was reading for was drunk. She agreed, but she said he was still unimpressed with her performance. She testified that he suggested a drink would help, and asked her what she would like. She said a glass of white wine, and soon enough one appeared in front of her. She said she remembers the kitchen table. Then she remembers waking up on a bed. She has her clothes on, but Cosby does not, she testified. He was lying down and forcing himself in her mouth. She felt sick and didn’t know how she got there. Next is another snapshot. It’s Cosby’s head at the end of the bed and she’s also on the bed. She remembers the positioning of the lights on the wall and heard Cosby’s voice saying, “You’re with Mr. C, your friend” and “Your friend is gonna come again.” She kept thinking “How did I get here this isn’t what I’m here for?” And that ends another snapshot. The next snapshot is her slamming the door to that room, and realizing she had just slammed the door on Bill Cosby. She remembers opening the door and saying she’s sorry that “she didn’t mean for that door to slam” and then closed it very carefully. And after that, it’s the next day. She testified that she woke up, told the chef she wanted nothing to eat, and went outside to clear her head and try to figure out what happened. She took some more photos, which were presented to jurors. She said it never even occurred to her to call her agents and ask about all this. Instead, Thomas said, she figured “I must have said something that made him think this was acceptable. I must have given some signal that, you know, she’s the kind she’s gonna sleeper way to the top.” She decided she would just have to move on. She still didn’t recall what had happened, was worried about her reputation, and also feared she might have somehow made a mistake or angered Cosby. So Thomas reached out to one of Cosby’s representatives, and they worked out that she would see Cosby when he had a stop in St. Louis. This time, Thomas paid for her trip. Thomas met him there, brought her camera, and took more photos, but Cosby met her at at a restaurant and had her join him at a table with several other people. She soon realized that she wouldn’t be able to ask him her questions in such a setting, and the driver and valet made it very clear that afterward they were taking her back to her place. She did get one picture of her with Cosby, but she said he “wasn’t very happy” after the flash went off. “It was clear whatever this mentorship thing is wasn’t happening, I wasn’t getting answers,” she said. She left acting soon afterward, got married, started a family, and became a music teacher. She said she has never gotten a settlement from Cosby and was not represented by a lawyer. Then came cross examination, from Kathleen Bliss, one of Cosby’s lawyers. She began by asking questions about how Thomas got into acting and her time as a beauty queen—Miss Littleton—while in college (Thomas said she was not a “pageant person” but did it for the scholarship money.) Bliss had questions about the Harrah’s drink tickets because, by Thomas’s own account, she didn’t actually remember going to Harrah’s. Thomas said she couldn’t remember how and why she got them “because I can’t remember anything after that first sip.” Thomas just knows she got them, somehow, because they ended up in her scrapbook. Bliss also asked Thomas about a cassette-tape recorder she had brought with her. Thomas said that, yes, she did bring one because she wanted to record her lessons with Cosby. When she woke up feeling sick, she talked into the cassette tape but left out the assault because “I couldn’t have my mom hearing me like that.” She shoved the tape in a drawer and eventually threw it out, she said, “after the psychologist visits and working through a lot of stuff and thinking ‘I’m done. I don’t want to deal with it anymore.’” Bliss also asked about the timeline of when Thomas arrived in Reno, suggesting the hot weather and bright daylights didn’t line up with the date and time on her ticket. Bliss asked Thomas a few questions about when she was interviewed by Cheltenham Township police. But then the cross examination had to end as court was wrapping up for the day. The cross examination of Thomas will resume tomorrow morning.